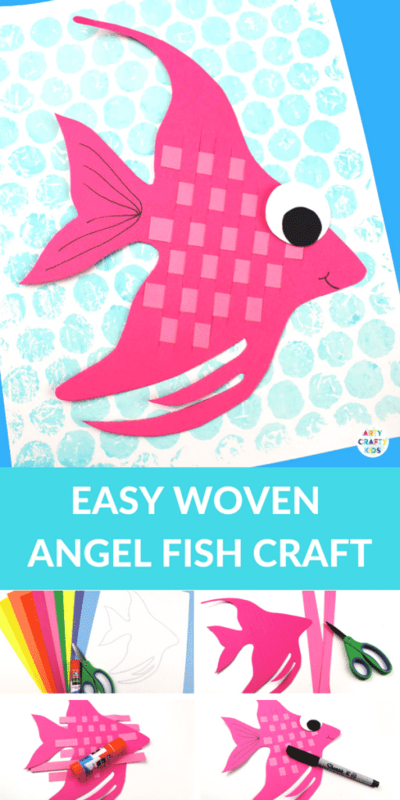 This gorgeous Woven Angel Fish Craft is perfect helping little hands master the process of weaving. The handling and motion of weaving in and out of the fish, is great for fine motor skills and coordination, and the overall effect adds a fun and interesting layer to the craft. Can you imagine how a collection of these would look on a bulletin board or within an under the sea themed display? Bubble wrap printing is a process we return to time and time again on Arty Crafty Kids (also, check out our bubble wrap octopus), and here we’re demonstrating how it can be used to create an underwater backdrop. Simple, effective and a great introduction into mix-media composition. Cardstock – White and a colour of the Arty Crafty Kids choice. 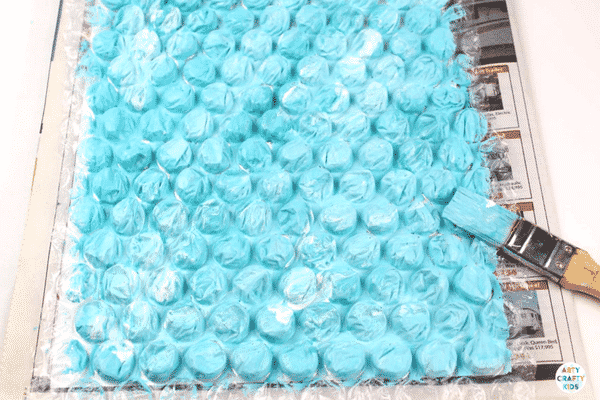 Step 1: Paint a large piece of bubble wrap with various shades of blue paint. This is a great opportunity for Arty Crafty Kids to explore colour mixing; creating light and dark shades of blue. 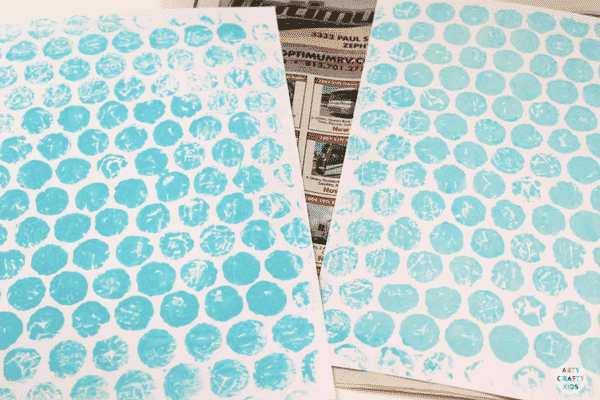 To create neat and defined bubble wrap print, I would recommend painting the individual bubbles with a paintbrush. However, if your Arty Crafty Kids decide to use big sweeping stroke across the bubble wrap, then that’s perfectly fine too. Step 2: Turn the bubble wrap over and place it onto the white cardstock. Press firmly all over the bubble wrap. 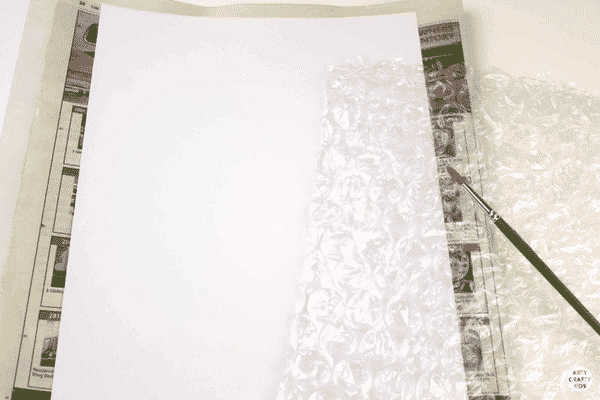 Step 3: Gently peel the bubble wrap away from the cardstock to reveal the print. Step 4: OPTIONAL – to create a layered effect, either use the existing bubble wrap or a fresh piece and paint the bubbles white. Step 5: Download the fish template and print out. Step 6: Cut the template out. 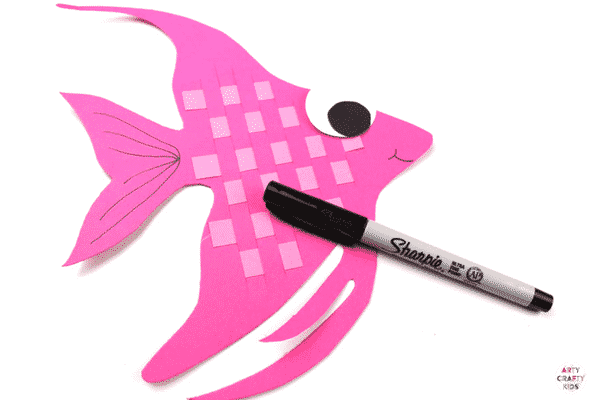 Trace the fish onto coloured cardstock and cut out. 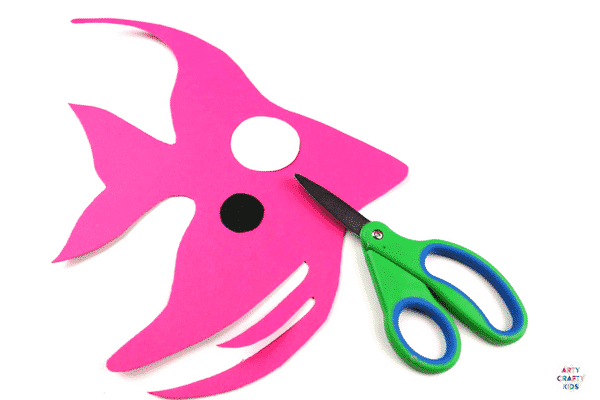 Using white and black cardstock, cut out two circles to create a big fishy eye! Step 7: Fold the fish in half and cut slits into the middle of the fish. Leave at least half of an inch all the way around to avoid tearing the card. Step 8: Using a contrasting colour or shade of paper, cut the paper into strips. 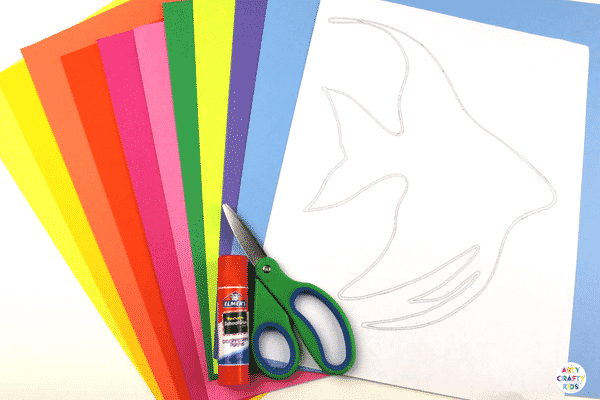 Get creative with this element by adding extra colours, textured or even patterned paper. Step 9. 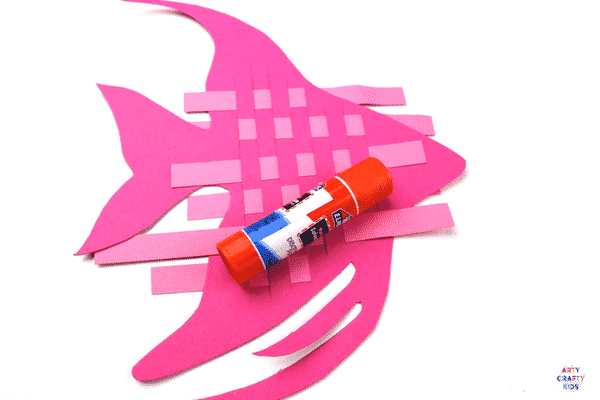 Weave the coloured paper strips in and out of the fish. Secure the ends with glue. 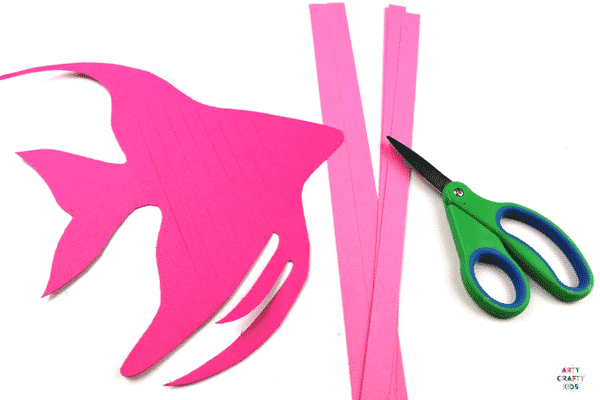 Use scissors to cut off any excess paper hanging over the sides. Step 10: Glue the eye together and then glue them onto the fish. 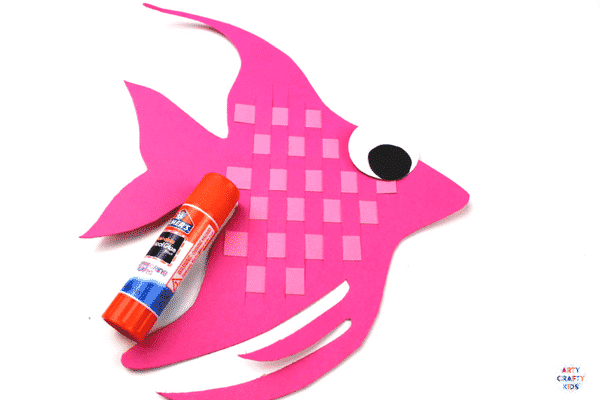 Step 11: Glue the fish onto the bubble wrap print background. 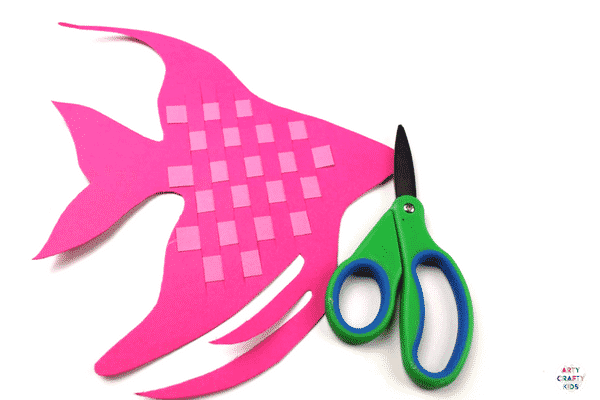 Download the Angel Fish Template! 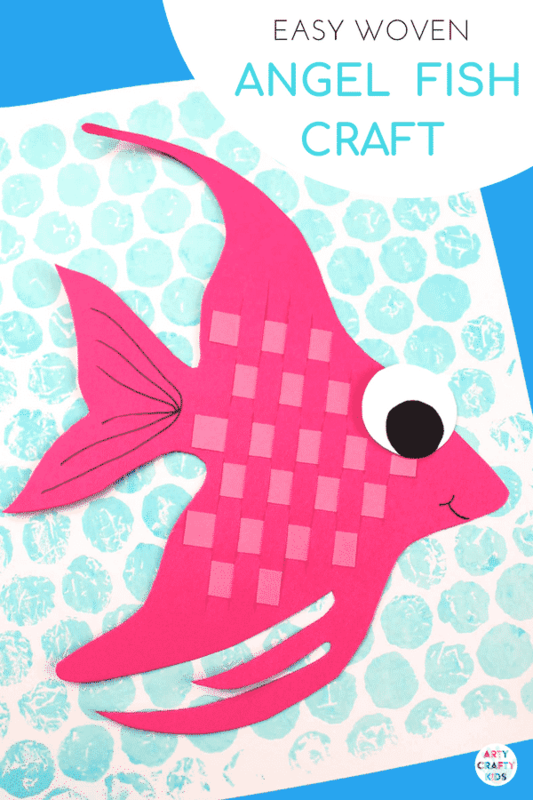 I hope the Arty Crafty Kids have the best time creating their own Woven Angel Fish Craft. The angel fish forms part of a growing series that will also include a crab and a super cute seahorse, so make sure you sign up to our newsletter keep updated! 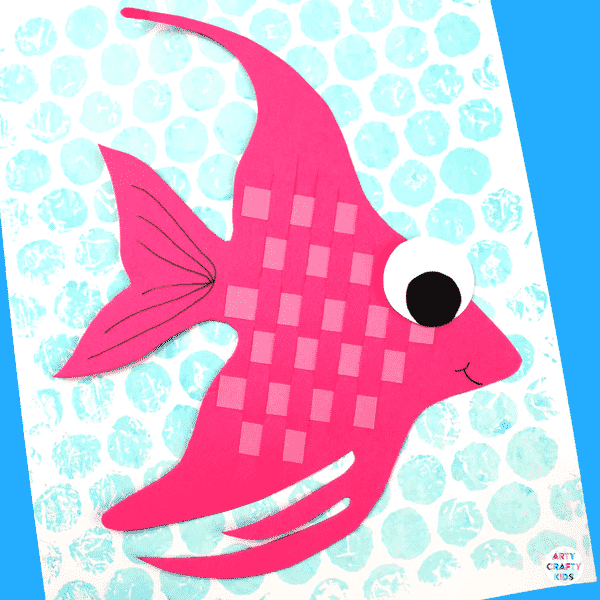 In the meantime, you may also want to take a look at our gorgeous paper rainbow fish.